Worcester Park's finest have really outdone themselves tonight in a mindless act of vandalism. 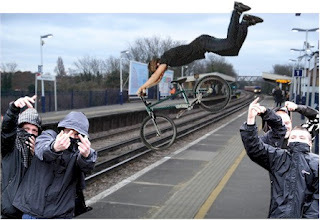 A group of teens (probably moved on from KFC) decided to hurl a bike onto the train tracks around 9.30 this evening, which promptly melted onto the live rail knocking all South West train services through Worcester Park into total chaos. Let's hope the chavs responsible for this dangerous disruption are rounded up, and then we can all gather round as they get chucked onto the tracks and have their tongue-studs welded to the live rail.